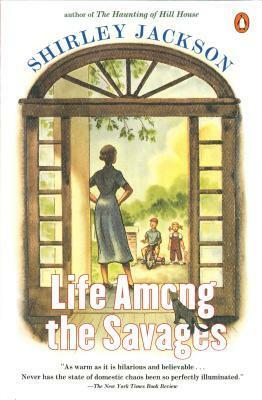 Life Among the Savages, Shirley Jackson, Penguin, 1953, ISBN 0-14-026767-0, $11.95, 241pp. Jackson, best known for the short story, “The Lottery,” and the novel, The Haunting of Hill House, also wrote this collection of humorous essays, gathered together from their original appearances in publications such as Mademoiselle, Harper’s, Good Housekeeping, and others. Given her famous work, and her reputation for brooding, intensely psychologically work, this is definitely a departure. Completely autobiographical, with a slight amount of exaggeration, this is an extremely funny book–I’m talking laugh out loud funny. It begins as Jackson and her husband move from New York City to the Vermont suburbs (I guess they commuted by train, and neither of them had to be there daily) with their two children. While there, Jackson discovers the “joys” of country living, rural schooling, and childbirth twice more. Maybe it’s just me, but I always put Jackson on the same footing with Dorothy Parker, as someone quite cynical about the world. Reading this collection, one does not get that feeling at all. Jackson shows herself to be quite laissez faire, flowing with the daily vicissitudes of suburban life, even, heaven forbid, a housewife. My favorite section here was about their eldest son’s first weeks at school. Laurie returns home with daily stories about Charles, a child who is obviously up to no good. The first day Charles was spanked for being fresh. The second, he hit the teacher. The next, he gets spanked for hitting the teacher again. Then he bounced the seesaw on a head of a little girl. He had to stand in the corner the next day for refusing to quit pounding his feet on the floor. The next day, his blackboard privileges are revoked because he threw chalk. Around the household, doing a “Charles” became a synonym for doing something bad.